Occasionally will throw a flower at the player's feet. Dances with players who initiate /dance with it. Also sometimes hops up and flaps its wings. Players can emote /dance while targeting Moonkin Hatchling and it will dance with them. As of January 6, 2019, this pet is no longer available from the Blizzard Pet Store. It was part of the "See You Later Bundle" promotion, and has since been "retired". Blizzard has stated that it might re-appear in the store at an undisclosed date in the future. As of Patch 4.0.6, the Moonkin Hatchling will fly along side a player mounted on a flying mount. 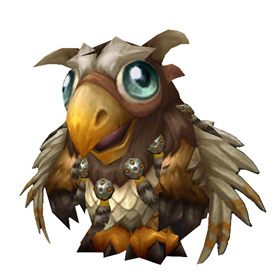 In 2010, proceeds from Moonkin Hatchling adoptions went to charity. It generated over $800,000 for the Make-a-Wish Foundation. Does anyone have any updated information as to this pet being bugged? I have a level 2 version and am unable to use it to battle at this point. Thanks in advance for any other information! As of 5.3, when you buy this pet, you will get the 2 version of this pet, one sent to the first Horde character you login into and one to the first Alliance character you login into. Having both versions of this pet only counts as 1 unique ingame, but 2 on this site. Not sure if it is a bug or intentional but my Horde toon has both the Alliance and Horde versions of this pet. They are both counting towards my pet achievments as well. However while my horde toon does have the alliance version I can't summon it. The new patch is letting the awsome little guy fly its so cool!! Oh little Moonkin Hatchling, all that flapping your tiny wings did has finally paid off! As of patch 4.0.6, you can finally fly! Congrats, little one! Here's a thought - Of all of us that purchased this pet, how many of us have ONLY Horde toons? If you have a Alliance toon, and they now have this pet, you are now forced to become a multi-character collector. Has to be one of the cutest pets ever! Finally as a hunter, I now have a druid for a pet! His little arms are able to flap and make him fly off the ground, even if only for a small bit. Maybe there is hope for his Bigger brothers and sisters yet! Plus he grows flowers randomly to bring cheer and smiles to your day. The dance is a /command you can give him. Also, he'll occasionally cast a spell and make nature grow! Taking after his namesake, he's the most eco-friendly pet so far. The distinct roar of the moonkin is one of the most terrifying sounds in nature.